I've always been a fan of bandanas, how they can dress down and add an edge to an outfit. Similar prints like paisley and scarf seem to have been around for a while but recently I've noticed that bandana prints in particular are now making their way onto the clothing scene and having their limelight. 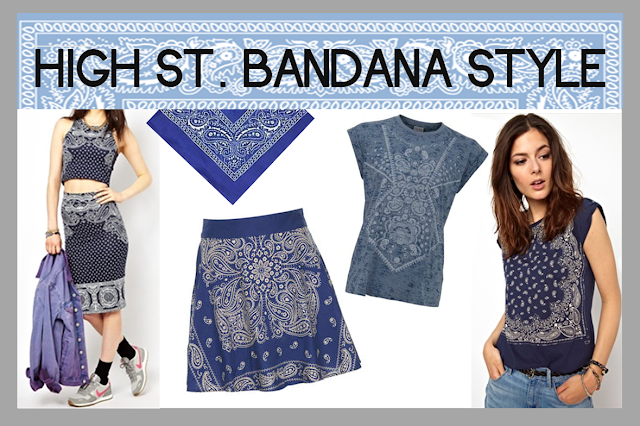 Here are a few high street bandana print pieces that I've been lusting over. The Illustrated people 2 piece caught my eye the most, I love it so much! Definitely want a two piece in my life soon! Although I love the emerging bandana print trend, I don't want to fork out a great deal of money on clothes over summer which this inspired me to make this DIY bandana print A-line style skirt which cost me roughly £3 believe it or not! Buy two bandanas in a colour of your choice. 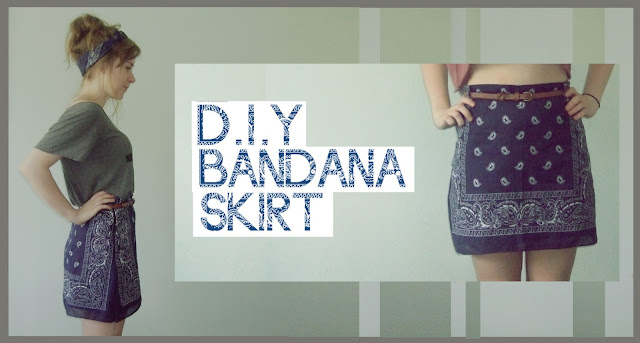 Cut both bandanas down to the length that you want the skirt to be (adding 1.5cm for allowance of the seam) If you are not including lining, I recommend just folding this section down rather than cutting it off. 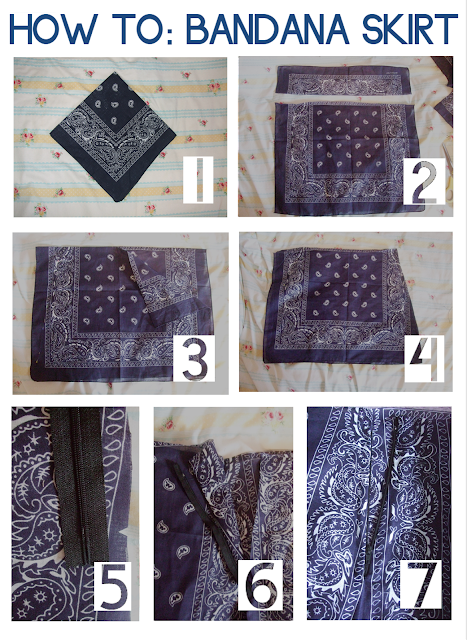 Place both bandanas ontop of each other with right sides facing one another. Pin both bandanas together at one side to create half of the A-line shape. Try the skirt on to make sure the shape fits you correctly. If the shape fits well, put pins in the opposite side (through one layer only) to mark where the other side should also be sewn, making sure that it is symmetrical to the side that is already pinned. Cut down the side where both layers are pinned together but 1.5cm away from the line of pins to account for the seam. Use a sewing machine to sew along this edge, following the 1.5cm seam allowance, taking pins out as you do so. Similarly to step 4; cut down the other two layers on the opposite side where the pins are marked, again accounting for 1.5cm seam allowance. Take your zip and mark where it finishes by cutting a small triangle out of the side of both layers. Then sew from the bottom of the skirt up to this marking to complete this step. To attach the zip; pin the right hand side of the zip to the upper layer of the skirt but make sure that the fabric is on top of the zip (so the zip is facing up but underneath this layer of fabric). The zip should finish where the seam you have just sewn starts. Change the foot of your sewing machine to a half presser foot and sew down this side of the zip as closely to the teeth as possible. Then turn the zip around as shown in picture 6. Pin the remaining zip edge to the other edge of the skirt, making sure that the raw edges are facing outwards like the other side of the zip you've just sewn. Sew the remaining zip edge. To finish the skirt you can add a lining or sew the waistline down and turn the skirt inside out to reveal the finished skirt. I added darts on the back of the skirt and belt loops to help give the skirt more shape which you could also do. Hope you enjoyed this DIY as much as I did making it, let me know if you make your own! I was surprisingly happy about how the skirt turned out, mainly because of how cheap it was to make but I'm really pleased with it; the bandanas are so lightweight and perfect for summer! This is great. I'm way to clumsy to even think about attempting something like that! OMG THIS IS SOOOO CUTE!! This is such a good idea, I love paisley print! I really like your blog as well! Hi Alex, what a clever idea! For a very long time now, I'm dreaming of making myself a skirt but there's always something that holds me back: unable to find the right fabric, lack of time, too hot (like now ... bad excuse really). Because I absolutely don't like drawing patterns, I thought a circle skirt would be the best option. After seeing this amazing and awesome idea, I think you changed my mind! I also really love the print of the bandanas. Do u have a video of this tutorial?